← Who remembers Pixy Stixs, and Lik-A-Stixs? 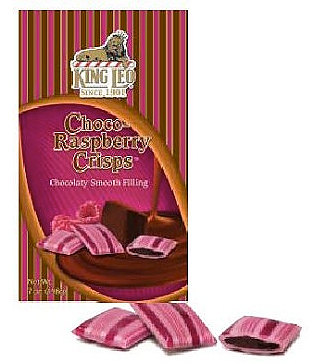 King Leo Raspberry Crisps are excellent; raspberry hard candy with a yummy chocolate filling. I just discovered them at T.J. Maxx, and now I want to know where I can buy them again. The only places on the internet sell them by the case, which is a little extreme even for me. If you see a package of these, buy it, you’ll thank me! Posted in Hard Candy, Milk chocolate. Bookmark the permalink.